Note it states “…the following design elements are MANDATORY” and under the number 1 design element it states: “The development mix required in this section is based on developable acreage of the site, which excludes land that is below the five (5) ft. contour…”. 59. Development. Any man-made change to improved or unimproved land including but not limited to the use of land or buildings, modification or construction of buildings or other structures or the mining, dredging, filling, grading, paving, excavation of or performance of drilling operations on the land. Now finally, connect the dots: Comprehensive Plan (Pre-stressed Concrete Area) = Traditional Neighborhood Development (TND) = Section 8.5′ of the CLURO = no construction or fill below 5′ contour. There is no provision for a waiver or variance and clearly, the restriction can NOT be circumvented by filling or grading the land. The diagrams in this post, prepared by Dr. David Depew, illustrate the areas within the pre-stressed concrete site that fall below 5’ elevation (areas encircled by the green lines), with side by side comparison to the proposed Port Marigny development. 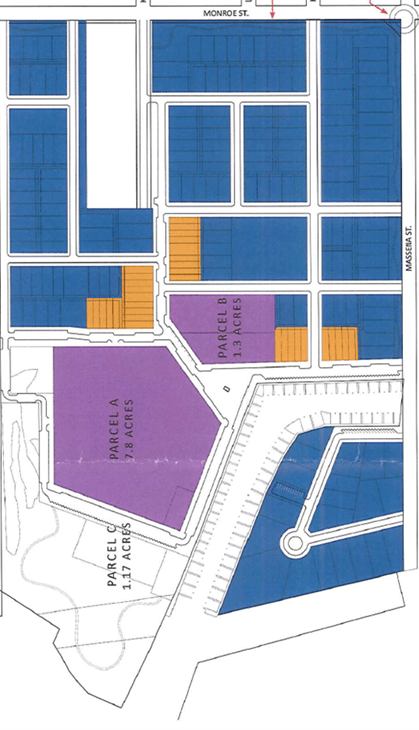 As one can see, a large portion of Parcel A and large tracts of the eastern side (right side of the development) are below 5’ elevation and therefore CAN NOT be included in the proposed development. What a FABULOUS recap!! It actually focuses on FACTS (gasp, what a concept)! The city adopted the CLURO and must live by its own rules (another gasp-what-a-concept). Thanks for taking the time to write such a succinct “spot on” recap. Keep it up to ‘gitter dun’ …. Great article. Brief, to the point and, how refreshing, the actual FACTS! Ditto Debbie’s comments….especially FACTS! CONGRATULATIONS BRETT on your 1st article. Any thoughts on the Champagne email claiming that the the low spots on the site were simply depressions left by the removal of concrete footings at the former Prestressed Concrete site and were not a case of filling in a natural flood plain to create new land? Is the contour issue a red herring? The terrain that would have existed if there never was concrete plant should be considered. The CLURO needs to be interpreted rationally not opportunistically by BOTH sides. If we dig up a stump – we are not then committed to keeping a hole there for ever more. ALSO – It says the density determination is made on land excluding “land that is below the five (5) ft. contour, wetlands AND floodways.” This could be interpreted to mean the land in question MUST be 1) five foot contour 2) wetlands and 3) a floodways to cause the exclusion. All three criterion must be met. Random depressions below five foot mark can be addressed otherwise.